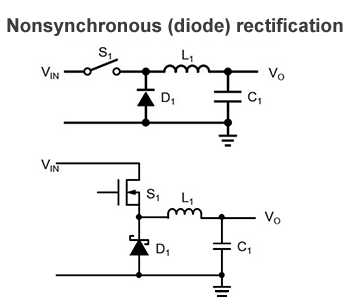 Following up on the types and operating principles of the switching regulators, we now discuss differences between the synchronous and nonsynchronous rectification methods for DC/DC conversion systems. Because each method has its own pros and cons, it is important to use them appropriately to suit the specific requirements for a given power supply. In terms of a circuit configuration, the question is whether Switch 2 is a diode or a transistor, as illustrated in the figure below. Nonsynchronous rectification is also referred to as diode rectification, where depending on whether the upper side transistor is on or off, the diode becomes conducting or non-conducting, or the current flows or ceases to flow, as was described in the section on operating principles. The nonsynchronous method, known for simplicity of operation and rugged construction, is widely used in industrial equipment and devices. In the synchronous rectification method, by contrast, which shares the same basic operation, the control circuit also controls the on/off operations of the low-side switch. Because if both switches turn on simultaneously, a current flows directly from Vin to GND, the event potentially destroys the transistors. To prevent this possibility, what is called “dead time”, in which both switches remain off, must be provided, adding complexity to the control operation. Nevertheless, because of its high efficiency when compared with the nonsynchronous method, the synchronous rectification method has contributed substantially to increases in runtime for battery-driven devices. When S1 is on, S2 is turned off. When S1 is off, S2 is turned on. Although the current path is the same as that for the nonsynchronous rectification method, the on/off operations of switch S2 are controlled by a control circuit. The lower circuit represents an actual circuit in which both S1 and S2 are composed of transistors. The lower circuit represents an actual circuit, where S1 consists of a transistor and D1, a Schottky diode. The synchronous rectification method offers a higher efficiency due to the replacement of a diode in the nonsynchronous rectification method with a transistor, thus minimizing loss resulting from the output-stage switch. As you may know, although the diode VF changes as a function of current, it amounts to 0.3 to 0.5V even in low-VF Schottky diodes. By contrast, the on-resistance of an Nch-MOSFET, for example, is exceedingly low, measuring 50mΩ. In terms of a voltage drop, it is significantly lower than the VF for diodes. With regard to this section entitled “Characteristics and Evaluation Method of Switching Regulators,” it is important to understand the operation differences between the DC/DC conversion methods and their characteristics. 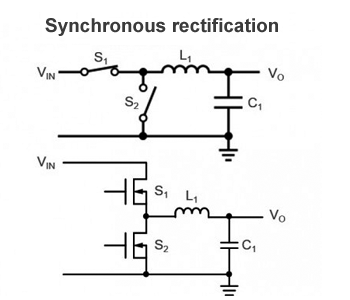 ・The synchronous rectification method delivers high efficiencies, but requires some increases in the number of components and entails a more complex circuitry when compared with the nonsynchronous method. ・The nonsynchronous rectification method, less efficient than the synchronous method, consists of a relatively simpler circuit.